This is my recipe binder. See its plastic, mayonnaise-proof covering? See its overly designed pages? 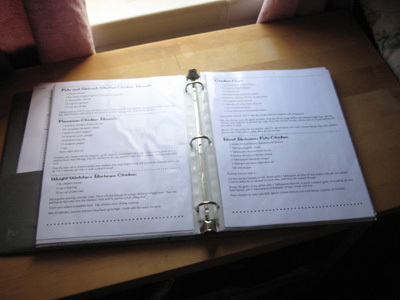 See how I’ve collected all my favorite recipes into one binder? Recently I’ve received several requests for recipes I’ve given a thumbs-up to which presumably won’t make the scale numbers go up too. I also talked to a food blogger a couple months ago who said the weekends are her highest traffic days because people search for recipes on the weekends. I put one and one together, and I didn’t get three, so I’m going to start posting my favorite recipes on the weekend for those of you who want to try new dishes. We’ll start out with Catfish Tuscany (made with orange roughy in Indiana). The recipe included ingredients I already had and looked rather simple, which are my main two requirements when choosing a new recipe. However, it also required me to use the broiler. Oh no! Not the broiler! I’d never used the broiler before and anything that heats up to 500 degrees scares me. However, cooking at such a high heat seriously reduces cooking time, so I tried it. The result was a yummy dinner that my brother liked so much he actually wanted the recipe. I am a horribly curious person and therefore must know what the small type on the front of the recipe binder says! Thanks for the post – I changed your link on my blog roll! That recipe sounds delicious! Tilapia is fine, but please don’t eat orange roughy! It is delicious – it was a favorite when I was a kid – but it’s not an environmentally friendly choice. Ohh yummy! Post more recipes! I love anything with cooked tomatoes. This looks awesome. At the risk of sounding like my children — ewww! Don’t think this is one I’ll be trying. Offer up something a little less fishy and I’m with ya! I used to not really like fish at all, but it’s definitely grown on me as I’ve worked on eating it more regularly. I even like some of the fishier fish now, which is saying something. 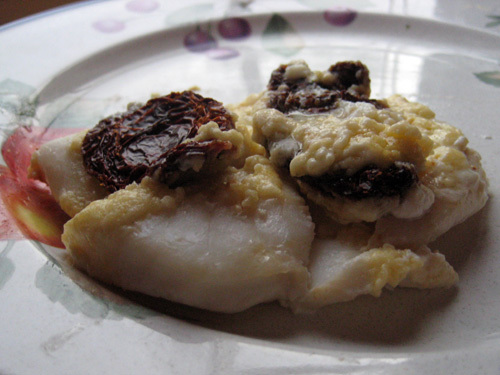 I haven’t thought about sundried tomatoes and fish, but that sounds good! We had coconut-battered fish tacos tonight that were really tasty. The fish bits were fried, but I loaded our plates down with fruit and veggies otherwise. I’d like to second (or third, or fourth) the recommendation to check out the Monterrey Bay guidelines on which fish are overfished. We are in real danger of making some of the world’s fish populations collapse permanently into extinction with our eating habits. I keep a fold-out, business-card-size list of which fish are okay to eat from where with me when I shop, which makes it pretty easy to check. The Monterrey Bay updates the list pretty regularly as fish populations change, so I try to remember to check 2 or 3 times a year to get the new list. (The list also includes info about which fish are high in mercury and other toxins—good new for women, who tend to be especially susceptible to such things and can pass them on to fetuses, as well). Interesting tip from the food blogger – I just checked my blog stats this morning and several of the searches were for “recipes” so seems realistic. Would be interested to hear your results. I have been trying to add recipes to my blog – mostly adapted from Weight Watchers and Cooking Light. 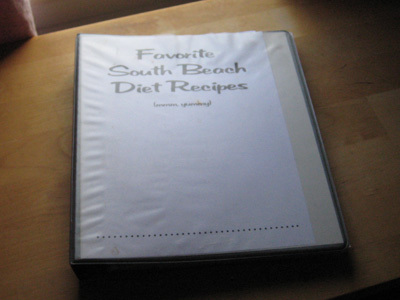 I also have a binder full of my favorite recipes. Keeps me from having to think too hard when I don’t know what to eat. Catfish IS probably the cheapest and most common type of fish available in my neck of the woods, but you usually only see it fried and served with tartar sauce (and I get easily bored with it). Might have to try this recipe though–sounds interesting. I had the same first impression about the tomoatoes being cherries, must admit. I am so trying this, it looks great! That sounds very tasty, I’m gonna have to try it this weekend! Awesome binder – my recipes are in a ratty, almost 2 inch high stack balanced precariously in my cabinet on top of Magic Bullet accessories. The seafood reminds me of my first 5K in July in New Bedford, MA. They had door prizes and I won 10 pounds of scallops! They were “wicked” good as they say up there. I look forward to more recipes – yay! I like to try new recipes on the weekends because while I know what I like, it’s hard to find dishes that please everyone in the weekend crowd (family, friends, kids) and are healthy as well. have spent most of the day looking at your blog. can’t believe i have never stumbled upon it before. 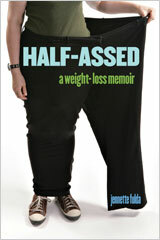 will be ordering your book on the next payday…congrats on the weight loss, truly awesome. cool binder…but sorry, the fish looks gross to me…what is that yellow/white clumpy stuff on it? I like recipes. I also like the new layout. Two for two, Pastaqueen. And just what is wrong with the library?? Hehe, just kidding :-) Looks like some tasty fish. I probably should not be reading this blog/recipe while hungry. Mmmmm, I tried it last night with rockfish and it was so good and easy! Not to mention, it looks really impressive. I should have taken a picture – that was maybe the most beautiful meal I have ever made. :-) We thought we might try it with light cream cheese instead of the mayonnaise for a less strong flavour. Also, thanks to your readers for the fish info websites! I’m glad to see that my wild caught Alaskan fish is all good! Phew! My freezer is pretty full and I would have been upset if it was full of mercury! I’m thrilled you’re posting recipes. I searched all over your site for the recipe after you mentioned ‘sweet potato muffins’ at one point. Any chance that could be your next posting?! Your blog (and book) inspired my boyfriend and I to try South Beach – 9 weeks and 20 and 15 pounds lost respectively we’re still going strong. Thanks for the tips and inspiration. 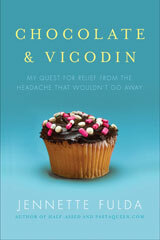 @Vanessa – I included the Sweet Potato Muffins recipe as part of the Super Secret extras on my book site if you proved that you bought my book. That offer is now closed, but I might post some of those recipes in the future.